Product prices and availability are accurate as of 2019-03-25 15:41:37 UTC and are subject to change. Any price and availability information displayed on http://www.amazon.com/ at the time of purchase will apply to the purchase of this product. 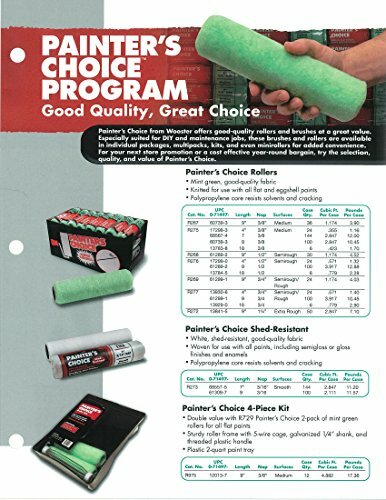 Painter's Choice from Wooster offers good-quality rollers at a great value. Especially suited for DIY and maintenance jobs. The Wooster Brush Company has been manufacturing innovative, high-performance painting tools right out of Wooster, Ohio USA since 1851. Our trade names include Ultra/Pro, Advantage, Yachtsman, Shortcut paintbrushes; Super/Fab, Super Doo-Z roller covers; Sherlock frames and extension poles; Jumbo-Koter minirollers; and Prep Crew surface prep tools. You can feel confident knowing Wooster is the name behind your painting tools.